Favorite traditions? Putting your hand on a piece of paper… drawing the outline and turning it into a colorful turkey! 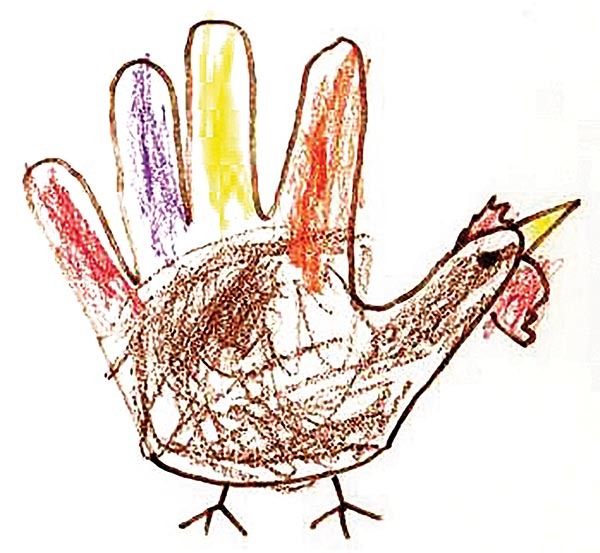 I think everyone of every age ought to color in a hand turkey every year around this time. Add a beak, wattle, comb, legs and feet and you have a happy turkey that doesn’t have to die for the cause. Hang it proudly on your wall or fridge!I love Thanksgiving, not for the pilgrims or the supposed starter feast, but for the wonderful food, camaraderie, and gratitude. It’s a time to be thankful for every little and big thing that is part of your life, and especially for friendship, family and getting to eat like royalty.My nuclear family began, and I adhere to the tradition of opening one’s house and table to anyone without a place to enjoy the Thanksgiving feast. On this day of thanks everyone needs a place at the overflowing table. The more the merrier!And I so love stuffing and roasting a turkey, cooking sweet potatoes and mashed potatoes and asparagus and broccoli and cranberry sauce and on and on. So, if I go elsewhere for “actual” Thanksgiving Day, I host a holiday dinner in the following days so I can cook! Come on down! We’re coming up on the dark time of the year again. The sun comes up later and later, the dark settles in earlier. People start to get depressed and anxious. It’s just how the planet works.That’s why human beings came up with a whole bunch of holidays to celebrate during the darker months of the year here in the northern hemisphere. To keep ourselves sane.Think about it for a minute. Now, I grew up in a totally different setting from most of you city folks. I grew up on a farm. On the farm, we LOVED the wintertime. We only had our daily chores to do, no heroic efforts on the vast acreage of our fields, of planting, tending, harvesting, storing. Those were all tasks for spring, summer, autumn.During the wintertime we ate all the canned tomatoes, jams and jellies we had worked so hard to put by during the fall. We made pot roasts out of the frozen beef and the potatoes, carrots and onions stored in the root cellar. We spent the short afternoons skating on the irrigation pond, then the early dark evenings walking home across the field, crunching the frozen crust on the snow, looking at the stars.The big jobs were cutting firewood, hauling it in and throwing it down a chute into a bin to feed the big old wood-burning furnace that crouched like some metal monster in the corner of the basement.Sometimes, if the harvest had been good enough to bring in a little extra cash, we traveled for a few weeks. My dad had ridden the rails during his youth, and he did love to travel.But we were always home for the holidays. Big old turkey and stuffing on Thanksgiving. Cranberry jelly from a can (fancy!) plus all the home-made pickles and relishes. Mashed potatoes, peas and carrots, gravy and more gravy. And pies, of course. With whipped cream.Christmas was usually a ham, and New Year’s my mom’s special dish of a pork roast and beef roast together in the same pan. And Christmas cookies. Lots of them.But the food wasn’t the star of the show. We would always go visiting on holidays. The aunts and uncles and cousins—we would go see them, or they would come see us. We set up plans and schedules using the old crank-handled phone on the wall. It wasn’t anything special—the grown-ups would sit around the kitchen table, drinking coffee and eating home-made donuts and the kids would play. The men would go outside to smoke and help out with any farm chores that needed to get done. The women would do the dishes. One of my aunts was infamous for stashing dirty dishes in her pantry for days on end, then pulling them out for her sisters-in-law to wash when they all got together.And winter was great for kids. There were new toys to compare at Christmas time, sleds to race, games to play and dolls to dress and undress, to feed water from a bottle and change their diapers. I remember the year I got a chemistry set (for a girl! How shocking!) and the year I saved up all my money to buy a copy of “Sgt. Pepper’s Lonely Hearts’ Club Band” for my cousin, who was the only one among us with a record player. She, like all my cousins, was a country and western fan, and more than a little disappointed.Nowadays it sometimes seems like we approach the winter holidays with something like dread. There are too many expectations, too much food, too many presents we can’t afford, too much time spent with relatives that we don’t like very much.Maybe we should look back for a minute at what the holidays are really all about. I’m not talking about anything religious here. I’m talking about biology. The winter holidays are “festivals of light” to cheer our spirits during the cold, dark times. So light some candles. Think about nice things you can do for other people. Go sledding down Reservoir Hill, then come home to some hot soup and fresh bread. Get together with your friends for a card game, and let your kids play with each other. Don’t trouble yourself about the political incorrectness of Thanksgiving, the ambiguity of the historical Jesus on Christmas, or the crazy public drunkenness of New Year’s Eve. Think about enjoying the leisure of winter, and make yourself a cozy nest where you can rest up for spring. As a child, Thanksgiving meant that special meal. At home. Home was that safe space with memories of Turkey and my favorite, mash potatoes and gravy. It was my immediate family all together and maybe a sleepy football game after the meal.At school, it was the story of the “Indians” sharing their food with the pilgrims. Sharing meant survival for the immigrants. At least it was a good story of people coming together. At this time of year we did not talk about killing our neighbors.As I grew to an adult it became, sorry to say, a burden to celebrate Thanksgiving. Going to relative’s homes became difficult when you had a partner and both parents wanted you with them. I don’t blame them for loving us. But trying to eat two gargantuan meals on the same day was not a delight. How to fix that?Both Paula and I worked in retail for many years. This was when retail stores were king and not much money was spent “online”. There was no online. That meant that Thanksgiving was a hectic time at work and that Friday after was the busiest day of the year.We had our home in Riverwest. It was not big, but we loved it. We decided we would not go anywhere on Thanksgiving. We invited Pauls’s long-time friend, Jan, over for the meal. On Wednesday evening we would walk over to Linneman’s Bar and experience the show. Nod to Bob, a tribute to Bob Dylan’s music put on by a long list of Milwaukee performers. Done with love and all money raised going to Hunger Task Force. Helping to share food the year round with our fellow citizens.Followed on Thursday with a meal shared by the three of us. A day to relax and take the time to care for ourselves. My folks are from the U.P. and came downstate to start their family (beginning with me, the oldest of five), in Milwaukee in about 1962. They came down to where the jobs were, since the iron towns where they grew up were getting rusty. Mining and commerce Up North just weren’t what they used to be. After about 10 years, they’d had enough of “city life” in Milwaukee and New Berlin (with a brief stint in Glen Ellyn, IL), and moved the family out to the sticks—which was then Waukesha County. Genesee, to be exact. When Thanksgiving came, Mom was deep into the homey traditions—cooking, baking, decorating, the works. Chilly, crisp weather was the norm, and “hearth and home” was a cozy place to be. As we grew older, all us “kids” eventually ended up in the cities of Milwaukee and Chicago (and environs), while Mom and Dad still enjoy life in the relative “sticks” of Waukesha county. It’s undergone a ton of development, but there’s still a lot of natural beauty. Lakes, rivers, woods, fields. The old traditions are still in place at the homestead, beginning with the partaking of hors d’oevres (cocktail weenies in the crockpot, cheese fondue, Chex mix, baked goods galore) that threaten to ruin our turkey lust. Of course, there’s football on the tube. The din of a houseful of people talking, catching up with each other, laughing. Some rooting on of certain sportsball teams. Skit-doing.Nowadays, the new tradition is to celebrate Thanksgiving on the following day, the Friday, at Mom and Dad’s. That’s so those of us with kids and in-laws can make it to our “other” families’ places on actual Thanksgiving Day.The day after, though, we still get to make that trip. Over the river and through the woods, to Mom and Dad’s … and, for my nieces and nephews, it’s “to grandmother’s house we go.” Just like in the old days. And for that, we are very, very grateful. It’s cold and grey outside, and the wind is blowing. My hair smells partially burned from the blow dryer. Mami might scold me if my hair is wet, because then I’ll get sick. She’s still overprotective of my health, and so I blow dry my hair every Thanksgiving.It’s keeping the news on all day to see what cool festivities the rest of the world is participating in while we get ready. Text messages and phone calls rush us through our bathroom routines. We’re all so giddy, almost nervous, to see each other again. It’s been months of communicating via group messages. Sometimes this is the only time we get with each other. It’s finally arriving to Mami’s and receiving many kisses and Spanish blessings. It’s compliments on being overdressed just to hang out, play spades, play dominoes or watch the Packer game. It’s arguments with out-of-town cousins over why Aaron Rodgers is the GOAT (greatest of all time). I can smell the juicy turkey in the oven. I can hear the oil crackling as plantains are being fried. I can see the maraschino cherries and pineapples covering the ham in the tinfoil dishes, one of many on the table. Food is ready and we are called in for family prayer. It’s laughing until we cry, eating until we bloat, being thankful to just have these quick few hours with each other until we must go, even though nothing feels more like home than this. To share a meal, to share the ancient celebration of harvest and cycles of time—Thanks-giving is a glorious holiday in my book.Having enjoyed a mobile life, I’ve enjoyed it in varied ways. Thanksgiving in: 1976—As a vegetarian student guest of a Texan family. Not eating meat was uncommon, almost rebellious, then. They welcomed me and served a special multi-grain loaf. Thanks, y’all! 1985—At home in Phoenix, Arizona, with undocumented guests from Central America. Fleeing war and persecution, living in fear (INS agents undercover in churches! ), grateful for the support and hospitality they’d found. Thankful for today, acknowledging tomorrow’s unknowns. 1988—Bonn, Germany, with fellow ex-pats. Pumpkins for pie were found at Turkish markets; a fresh turkey scored; even a football game transmitted. Laughing, sharing, thankful for the jolly patchwork.1995—With Wisconsin family visiting our family of four at home in Indiana. The children perform a self-directed play included gowns, weapons, songs, and confusion. Charming youth! We’re all grateful. 2004—at home in Austria with friends. A recently widowed grandmother joins us, charmed by the American traditions which appeal as mildly exotic. The happy communal meal is familiar to all. We toast to the seasons of life. 2007—Mega-holiday develops in northern Wisconsin. For a few years, one aunt and uncle host dozens of all ages from both of their families. Bounteous buffets, multiple tables, a raucous talent show! Thankful for a wild a wonderful bash together.Lately, each year develops its own version of this celebration. Whatever we have or suffer, the core holds true: we be thankful. To be twenty-two living in Milwaukee without much family in the area would perhaps have frightened me as a child, especially close to the holidays. This marks the third year in a row that’s passed without my family and our traditions. My aunt and uncle moved away with my grandparents three years ago, my sister has left for college in South Dakota, my mom lives in Florida, and although my dad still lives in Milwaukee, he is often busy traveling. My first year in college, I was lucky enough to have close family friends who invited me to their Thanksgiving, and who allowed me to fly out to California the second year of my schooling for it as well, after they’d moved. There was never a sense of loss from spending the day with them instead of my family because they loved me as family, and I adored them. I was never alone, nor lonely. My heart was full; maybe even more than the years I had with my family. Life is different now, but it doesn’t take away any of the happiness that has always enveloped me through the holiday. Though straying from tradition can be distressing or even unfulfilling, I’d make the argument that being open and excited for new ways of celebrating with people who are important to me has brought me more anticipation for Thanksgiving than ever. This year I’m spending Thanksgiving Day with my boyfriend and his family. I don’t know what to expect going into it, but the same sense of delight flushes me when I think about it. Family is important and I miss them at times, but figuring out my own life, especially through big holidays without them, reminds me it’s acceptable to find true enjoyment in other people as well. —Memories and Thoughts on Thanksgiving from our writers.